Differentiation is difficult. There is no doubt about it. I’ve been on a mission to find small ways to differentiate without stressing myself out, and without stressing out the teachers I work with. I often found myself realizing that I was giving one math problem to the whole class when I’d look at my gifted kids faces. You know that look on their face? That boredom in their eyes look…where they’d rather be someplace else than sit and do another problem that they already know how to do. That is what inspired my idea of just putting two problems up, a meets the target (happy) problem and an exceeds the target (stressful) problem. I always explain to the students that if you are able to complete the happy problem correctly, you are meeting the target. It is even more impressive if you can do the stressful problem, but it’s not necessary. Here is an example. 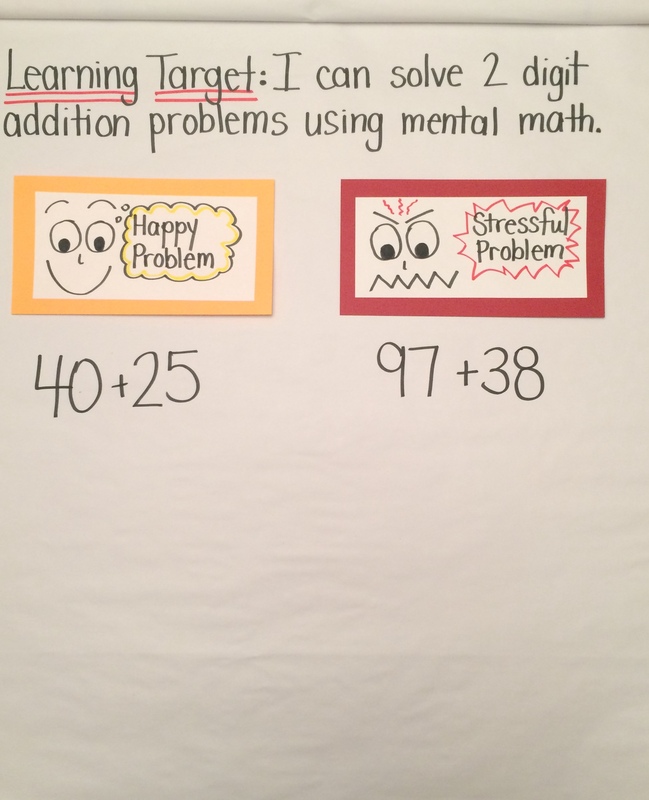 Today in a second grade classroom the learning target was adding 2 digit numbers mentally (without regrouping). I put up two problems, the happy one was a check for me to see who had it. (They worked in their notebooks but it’s also great to use dry erase boards.) The stressful problem is the one that students who need to stretch their thinking just a bit might try after doing the happy problem. Using two faces makes it both visual and fun for students. Cut them out and reuse them over and over! I keep those little face headings handy, they go up on dry erase boards, chalkboards, and easels…wherever we are doing math. If I forget to put two problems, the students definitely remind me. They love to see the stressful problem face, especially the first time when I draw it in front of them. You can use this method during quick checks, problem solving, mini lessons, practice, mental math…the possibilities are limitless. This is something that can be done quickly, and doesn’t require hours and hours of work. For years I have struggled with differentiation. I’m just being honest. It is something that I know is right, but it was always my greatest challenge. I saw this somewhat shocking opinion piece written by a former professor James Delisle titled Differentiation Doesn’t Work. He asserts that differentiation is an impossible farce and a joke due to the fact that teachers cannot possibly implement it. He says it doesn’t work, and that it never will. I would recommend reading the entire article, because you will feel his passion and doubt come right off the page. It really made me think. Here is one small step (with more to come in the future! ): Turn a worksheet into a challenge (or modify it) by changing the numbers. Sometimes I have this idea in my mind that I have to come up with a completely different assignment for gifted students. Or that I must have a reteach assignment for strugglers. While I do think this is a good idea for some of the time, it’s just not practical every day. 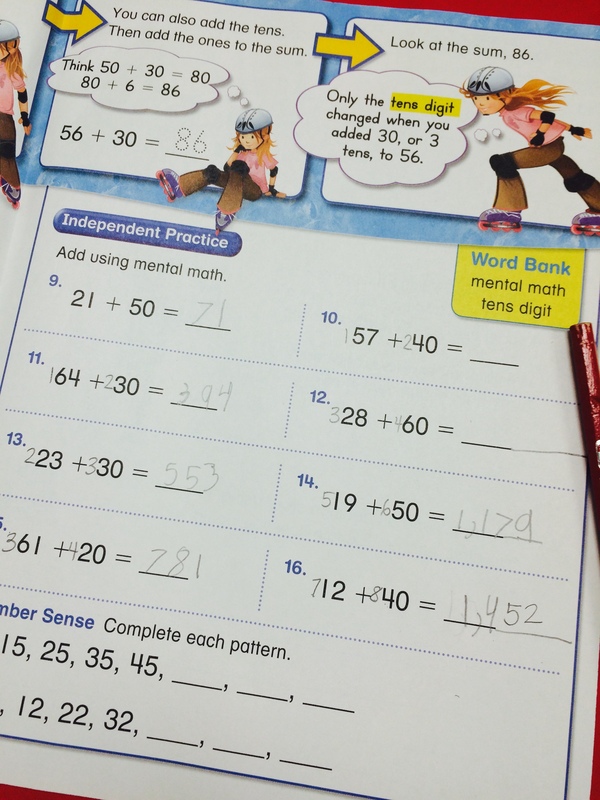 In a recent lesson second graders were adding two digit numbers. There was a small group of students that was catching on quickly to the lesson and needed just a little more of a push. I put the numbers in front of their two digit numbers to make them three digits, and their eyes grew big. It was just enough to extend the learning target just past their comfort level. It helped them see that the learning could extend to larger numbers. Tips for Differentiation: Change or add numbers on the assignment to make it easier or harder. The best part was that it took me 10 seconds per student to add the numbers! With only 4 students that needed it, I could differentiate for them in under a minute. A very small way to differentiate effectively. Sometimes we are too hard on ourselves and think we need this huge project, when something like this is enough to challenge and extend their thinking. It is time to stop beating ourselves up! We can do this if we share our ideas with one another. More to come with small tips in future posts.